I have been researching a second book and decided it needed a new diet. The first century Palestinian diet was a fascinating experience and it greatly helped me prepare the book, The Food and Feasts of Jesus. I learned a diet from the time of Jesus could be quite healthy and tasty. This time, I think I want to try a diet made from the foods of both ancient Greece and Rome. There is more written about these two ancient food cultures and the cuisine was not all that much different than the food from the Middle East. This time, I will not have to eat just foods from an ancient kosher menu but will be able to branch out and try new culinary experiences. Earlier this week, friends and I prepared a first century feast for sixteen friends. It was a perfect combination of food for the cold weather we have been enjoying here in the high country of Colorado. The main course was a stew with barley and beef ribs. This stew would taste good with herbs and spices like cumin and cilantro, but we used our Middle East spice mix and a lot of fresh dill. Along with the stew, we had asparagus with lemon and thyme, a wonderful salad made with cucumbers, onion, and chick peas. The appetizers were equally appreciated: olives, pistachios, roasted almonds, and a delicious home made hummus. However, the hit of the evening was the lentils. They turned wonderfully, almost creamy, with onions, carrots, and a lot of garlic. Cumin and dry mustard are my favorite flavorings for lentils. Dessert was pastries stuffed with figs or apricots and dates with cream cheese. We cheated and enjoyed a little coffee — certainly not very first century — but perfect with the pastries. Homemade bread was served throughout the meal. The bread was made using the Mediterranean Grain Bread recipe from the book. In fact, all the recipes came from The Food and Feasts of Jesus. But do look for the Mediterranean Grain Bread recipe on-line. Patheos book club posted it on their site. It is a tasty grain bread! But the true highlight of the evening was the sharing of food and wine – yes there was wine, too – with good friends. Feasting with friends is always a wonderful experience; I think it is just about the best possible way to spend an evening. Prepare your own feast for friends and enjoy. If you drive around our nation and take the time to exit the interstates, you will see many small and large American farms. The prototypical farm from our past includes a number of buildings, including a house, barn, workshops, storage sheds and a number of other out buildings. This was not the case in the ancient world. For the sake of safety and for connection to the community, most ancient farmers lived in towns. The family farm might be as close as the edge of the village or it might be two or three miles away. Every day the farmer, his sons, and coworkers started their work by walking and ended the day by returning home. Can you imagine walking six miles a day just to go to and from work? There were exceptions to this practice. Farmers often had storehouses and slept on their land in small structures called tabernacles during harvest times. Wealthy farmers who owned very large parcels often built manor homes on their land. Archaeologists have shown us that these homes were much like miniature villages, with cooks, black smiths, servants, slaves, laborers, shepherds, overseers, accountants, and their families. Still, the land holdings of these farmers were large enough that most of the laborers must have walked long distances to their work. When first beginning to study first century Palestine, I was impressed by the idea that Jesus and his family and neighbors walked to Jerusalem for annual festivities like Passover. Nazareth is seventy miles from Jerusalem and the road is not flat. No one except military officers and very high ranking political officials would have ridden horses. Even donkeys were reserved for luggage and the richest merchants. Everyone else walked. I estimate that the trip took three days. Let’s see … seventy miles, three days. That is three long days. Just as an experiment, I walked twenty-one miles one day. It took months of training, expensive shoes and socks, and more than one blister. But in a sense, for the average person in the first century, every day was a day of training, except, of course, the Sabbath. Imagine how fit we would be if we trimmed most fat and all sugar from our diet and then walked six miles a day. Do check out The Food and Feasts of Jesus; Inside the World of First Century Fare. It should be released almost any day and prerelease copies are still available from most online booksellers. And in all things, keep the feast. I know that it has been quite some time since I have posted on this blog. Quite frankly, my writing energies have been focused somewhere else. With my friend, Joel Pugh, I have finished my book on first century food: The Food and Feasts of Jesus; Inside the World of First Century Fare. The book is being published by Rowman and Littlefield and will be released on July 16. Pre-release copies are already available, at discounted prices, on Amazon and Barnes and Noble. For those still checking this blog, I hope you are able to get a copy of the book. It contains fascinating information and lots of my first century recipes. In all you do, keep the feast. Several night ago, we ate first century snacks for dinner: olives, pita bread, some of my home made cheese, and dolmas. And, no, I did not make the dolmas. One of the wonders of the twenty-first century is that even grocery stores in Pagosa Springs, Colorado sell decent dolmas. I have made them in the past and recently bought several jars of brined grape leaves so I can begin to develop new recipes. Most modern dolmas use rice as a stuffing, which raises an issue for the first century cook. Even though a few food historians write that rice was present in the Holy Land by the first century, the majority of scholars believe that rice arrived several hundred years later. Rice was first cultivated in India and worked its way east to China and Japan before it started its journey west toward the Middle East. I will try making dolmas with bulgar or barley as the stuffing and see what happens. Before food preparation, the grape leaves should be softened. Gently boil fresh grape leaves for five minutes or use brined leaves which are available in many markets, maybe even in Pagosa Springs, Colorado. I imagine that both methods were used in the first century. Brining was a common way to preserve food, even grape leaves. If using brined leaves, drain them, remove and separate leaves very carefully. They tear easily. Please join me in my quest for the perfect first century style dolma. The wine is almost finished. The second fermentation is complete and we are now clarifying the wine and waiting for all the sediment to settle. We will bottle the wine within a week or two. We will then have a “new” wine. Actually, we will allow our malbec to sit in the bottle for at least six months before drinking it, though we have already done a little tasting. It is good wine, dry with oak overtones. Yes, we aged it with oak chips. It still has a little yeasty flavor which should disappear while it ages. I mentioned in my last blog entry that the yeast for making wine occurs naturally on the outside of the grape skins. There are actually two types of yeast. The first variety begins to consume the sugar in the juice immediately after the skins are broken. Within several days, the alcohol level is already around 3% and the alcohol, a byproduct of the yeast consuming the sugar (called “fermentation”), is strong enough to kill this yeast. Then the second variety of yeast “kicks in” and the process of fermentation continues. We used wine yeast that comes in a little packet. Many first century people preferred flavored wines. Honey was a favorite flavoring. So were cinnamon and cloves. First century folk also watered down their wine, sometimes by as much as fifty or sixty percent. Both fermentations usually took place outside, so at least some of the water evaporated. but maybe they just preferred thinner wine. It certainly helped the wine last longer and cut down on drunkenness, especially when it was consumed for lunch, or for breakfast! Try this: heat one cup of water and one-half cup of honey until the honey completely dissolves into the water. Then add one bottle of wine. You may also add traditional mulling spices, like a stick of cinnamon, several cloves, lemon zest. Try other spices and herbs. Continue to heat but do not let it come to a boil. Serve at room temperature or, because it is winter, drink it hot. I have made cheese. I have brined olives. I have baked bread. For a true first century experience, I have to make wine. To begin, I have to admit that I have made wine on three different occasions. Each batch makes approximately six gallons, or around thirty bottles. My first two efforts produced a mediocre Shiraz. I chose shiraz because it was one of the grapes that was used to make wine in the Holy Land back at the time of Christ. For my third recipe, I used Italian Amarone juice. It resulted in a real decent wine, not quite on par with the Amarones from Northern Italy that cost around $60 a bottle, but still quite drinkable. This time I am making wine with a friend, Kenny Rogers. We are making a malbec. Our initial tests and tastings show that it should be a nice hearty red wine with an alcoholic level close to 14%. The experience is not quite like that of the fist century. Wagonloads of grapes were taken from the vineyards to a winepress – literally a hollowed rock. Family members would stomp the grapes (remember I love Lucy) until all the skins were broken. The yeast producing the fermentation was naturally present on the outside of the grape skins. 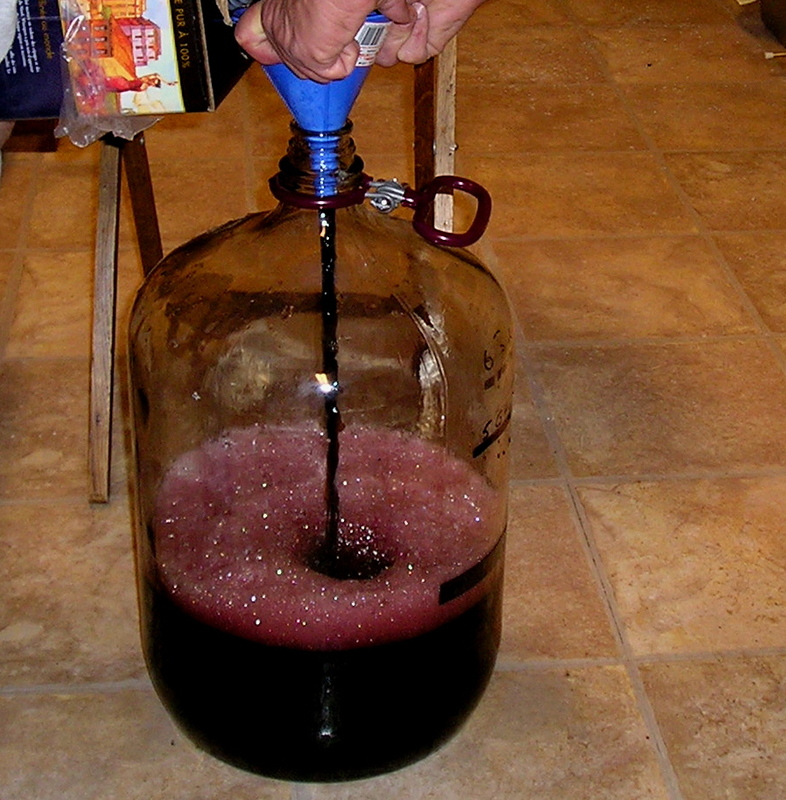 Within three days, the grape juice was already fermenting and had a alcohol content of 3-4%. After fermentation, the wine was stored in amphorae, ceramic heartshaped containers with handles that held around six gallons. The tops were sealed with wood stoppers and pitch, to keep the wine from being exposed to air and spoiling. We used juice concentrate and prepackaged wine yeast. This is not quite the age of Wolf gas ranges and Sub-zero refrigerators. You have to imagine, no electricity, no gas, no self-cleaning anything. Except during the winter rainy season, a typical first-century family used their courtyard for cooking. Households typically had a brazier, or large curved metal plate for building a fire and cooking supper. The brazier was small enough that it was moved inside during bad weather. I love the idea that someone could walk down a first century street and smell everyone’s dinner being cooked in courtyards. In addition, most families had a bread oven, too. This was a domed-shaped oven with an opening in the front. A family member built a fire every morning and by the time the dough was ready to bake, the temperature was likely well over 500 degrees. Cities had neighborhood bakeries where people could buy bread or bring their dough to be baked. Many Mediterranean area cities and villages continued this tradition until quite recently. Mediterranean and Middle Eastern cooks used a variety of tools to prepare their meals, including mixing bowls, pots, kettles, and casseroles for stewing, braising, boiling water and for deep-frying. Some of the cooking vessels had narrow opening on top to keep the water from evaporating and escaping during cooking. These pots were ideal for making soups, porridges and were used to cook beans and lentils. 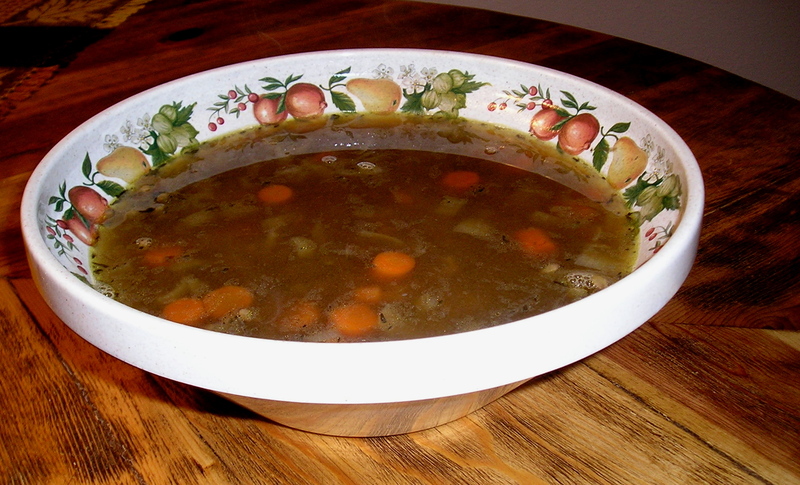 First century casseroles were similar to a ceramic Dutch oven. Baking dishes were common in the Italy and Greece and were beginning to appear in Middle Eastern kitchens during the lifetime of Jesus. Most cooking vessels were pottery, though some of them, especially those used by wealthier families, were made of metals such as copper or bronze. We know that metal pans are much better conductors of heat than clay pots, but pots and pans made of materials like copper were very expensive, just as they are today, and were well beyond the means of the average family. Pans were made by professional potters and metal workers and were made to standard sizes, such as they are today. The home cook at the time of Jesus also had griddles for frying breads and meats. Griddles were constructed of some type of metal such as iron or copper. They also used kitchen aids and utensils such as mixing bowls, mortars and pestles, funnels, cooking and serving spoons and knives that were used to assist them with food preparation. First century cooks also had standardized measuring spoons and cups! We have been out of town for every weekend this month. The first week I went to our diocesan convention. Then there was a statewide youth retreat followed by a rush trip to the other side of Colorado so my son could audition for All-state choir. Because of these trips, we have not been able to sit down for a Sabbath meal since my last Sabbath entry. Last night we finally were in town and able to join the Feast. It was good to cook a nice meal. It was even nicer because my wife Sally cleans the mess I make while in the kitchen, an arrangement we have followed for twenty years. We ate meat. I have not had a lot of meat since beginning my culinary journey to first century, though probably more than the average Mediterranean family. Just several weeks ago, I went to a “Steak and Stein” gathering at our church where a friend cooked me a steak. To enjoy such delights at a banquet as a guest was certainly characteristic of the time and I took full advantage of the treat. Blessed are you, Lord our God, King of the Universe, for you nourish us and the whole world with goodness, grace, kindness, and mercy. Blessed are you, Lord, for you nourish the whole Universe. This is the translation of an ancient Jewish blessing for the food at the Sabbath. It certainly seemed appropriate for our feast. We had beef that was cooked with onions and my friend Joel’s regional spice mix; asparagus cooked with olive oil, thyme and kosher salt; and steamed cracked wheat. One piece of news: a friend has let me borrow her pizza stone. Mine is in storage. I will need a pizza stone to make my own pita bread. Until now, I have been using “store-bought” pita, which is permissible. Unlike small farming communities, like Nazareth, large cities had professional bakeries. Some had neighborhood ovens where residents would bring the bread to be baked. So it is OK to buy bread, but better to make it. I don’t know about most blogs, but this one is bring me a lot of fringe benefits. I have already received wonderful gifts. First, someone in town gave me a box of fresh figs. They were wonderful. I certainly miss the fig trees that friends had in Dallas. Then there is honey. I have received honey from three sources. Tom Greenley and his Bee’s Knees bee keeping business is supplying me with my local Pgosa Springs honey. It is excellent and I had several quarts; I now have one quart left. I hope it lasts through the winter. One theory is that eating local honey can help cure hay fever. It works the same way as allergy shots. The shots inject small amounts of the offending pollen into your body and eventually your immune system becomes used to it. Locally harvested honey is loaded with the offending pollen and daily consumption produces the same results. Let’s see, weekly injection or two tablespoons of honey every day? I am leaning toward the honey cure. But there is more, honey that is. Bob Pohly, the friend who recommended that I use WordPress and helped me set up this blog, has a brother who is a beekeeper in Berthoud, Colorado. His brother John sent me a delicious jar of his honey. So did Kay Beatty’s son-in-law. Kay belongs to a sewing group that meets in our church. Her son-in-law has a farm in East Texas, near the town of Tyler, and keeps hives. All three of the honeys are distinct, yet each is very delicious. I may not get to drink coffee or eat sugar, but I do get to eat a lot of honey. Honey was the primary sweetener in the ancient world. It was used for desserts, sweet breads and pastries. Honey was mixed with yogurt or fresh fruit to make a simple, sweet dessert. A little honey added to bread dough helped it to rise and gave the loaf a little sweetness. Several tablespoons of honey and a handful of raisins transformed the bread into dessert. Cakes had honey poured over them after they came out of the oven. Adding a little honey to a stew or other savory dish adds balance to the finished product. I have been given yet another wonderful gift … lamb. A member of my church bought a whole butchered lamb and has given me several packages of the meat. You will be hearing more about lamb in later blogs. Another friend, Nancy Williams gave us a bowl full of delicious lamb meat balls. She left the recipe in the “comments” section of my blog site. The recipe includes several ingredients that were not available in the first century: Bisquick that can probably be replaced with regular flour and red peppers which can be deleted. You might use lemon zest instead of the lemon pepper, but use a little extra black pepper. Better yet, if you are not strictly following a first century Mediterranean diet, then I recommend that you leave the recipe exactly as Nancy developed it. Put all ingredients in a large bowl and mix with your hands. Pinch roll into small balls and place on a greased cookie sheet and bake at 350 until brown.